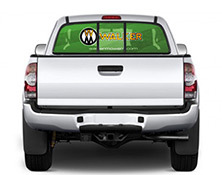 Do you have an enclosed trailer, rear truck window or large area for attaching full color Walker photos or a graphic? Walker provides large photos and the Walker Mowers graphic free of charge for Walker distributors, dealers and end-users. This collection of high-profile color graphics are perfect for the sides and backs of enclosed trailers. They are easy to install and give a professional look to any mowing crew. These decals will also work great on dealership walls. Decals come with an application squeegee and mounting instructions. 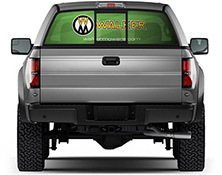 These highly visible color graphics are eye catching and will help your truck stand out from the rest. The graphics come in two trimmable sizes to fit both large and small cab trucks. They work with both solid pane and slider windows and do not block your rear view. They are easy to install and come with an application squeegee and mounting instructions.